These Halloween window clings, or decals, are an easy way to add to your Halloween decor – they also create an eerie glow with the help of glow-in-the-dark paint! Print the Halloween window cling templates or draw your own designs on paper. Place your designs inside a heavy plastic bag (such as Ziploc sandwich bags). Tape the bag down on your table so that it doesn’t move. Trace over the main outlines of your design with fairly thick lines of leading paint. Allow to dry according to manufacturer’s instructions. Mix two tablespoons of white glue with orange paint to the desired color, and fill in the pumpkin color between the leading lines, making sure that the glue/paint mixture is applied fairly thickly and that it touches all points of the leading lines. Do the same with 1 tablespoon of white glue and black paint for the bat. 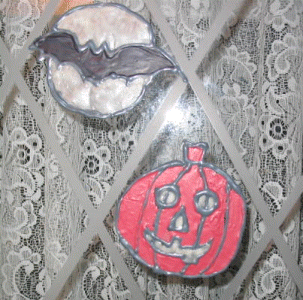 Fill the facial features of the pumpkin and the moon surrounding the bat in glow-in-the-dark paint, applying the paint fairly thickly (the more paint you have here, the more intense the glow-in-the-dark effect will be). Allow to dry thoroughly, usually overnight. Un-tape the bag from the table, and peel your window decal away from the plastic. Apply to a sunny window where the glow-in-the-dark paint will pick up its energy from the sunlight. Enjoy the eerie glow when it gets dark! I have found that although these window decals can be moved a few times, once left in place in a sunny window for a few days they can be peeled off, but tend to break up. I would therefore regard them as a temporary decoration for Halloween.